There is nothing quite like topping your cooking with a selection fragrant herbs, especially when they are fresh and can be plucked from your very own backyard. A herb garden is an essential for every backyard- whether you are a green thumb or garden novice, everybody can plant and maintain a burgeoning herb garden! The joy in herb gardening is the little maintenance they require for upkeep, small space they take up, and of course the flavoursome produce they provide. What to sow and grow? First things first- you will need to decide what herbs you would like for your brand new herb garden. There are a huge range of herbs available to grow, however there are a few that are a little more hardy and so, ideal for beginner growers. fresh water- be it by hose, watering can, or even a cup filled from your kitchen sink! If there is one thing to get right when it comes to growing a successful crop of herbs, it is where the are planted. Herbs do well in medium sized planters and most prefer full sun, so it is best to try a place them in a location where they will get plenty of sunlight. If you are located in a really warm climate (we’re looking at you north queensland), you might want to choose an area that gets plenty of sunlight throughout the day, with some afternoon shade, as to not overheat and stress them. There are a few exceptions- mint, parsley and coriander, which will still grow well in a more shaded area. It pays to do some research prior to planting and check where each particular herb will grow best, and plan your garden and its location around this. Is it time to get dirty yet? So you have chosen your herbs, you have chosen their location, and you have your planters and soil at the ready- yes, it is time to plant those flavoursome little fellows! Take the soil and place it into the planters, mixing it with your hands to make sure it is more loosened, not incredibly tight and compacted, to allow for good drainage. If potting, make sure there are plenty of drainage holes too, to assist with this. If you have some compost or organic matter available, you should use this to condition your soil for extra nourishment. It’s time for action! If you are growing your herbs from seeds you will simply need to create a small hole in the soil and place a few seeds in each, spray a little water on top then cover the hole. Make sure you don’t over plant, and there is plenty of space between each herb variety to ensure they have enough room to grow, grow, grow! 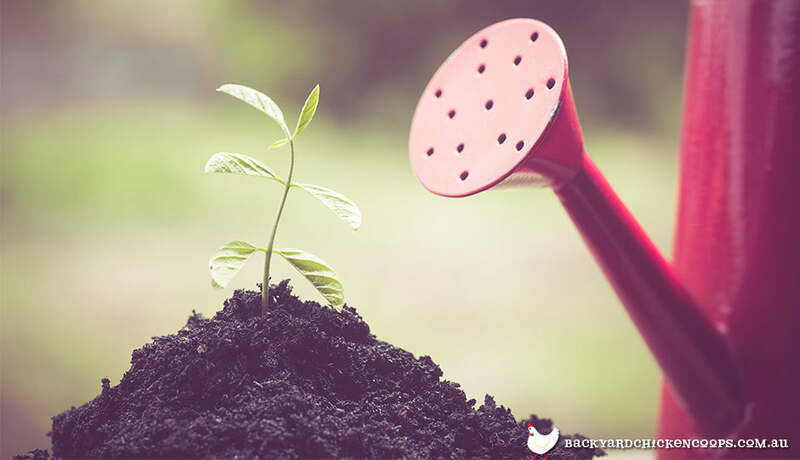 If you are planting young plants, loosen the soil around the plant and gently pull it from its pot. Dig a small hole, large enough to accommodate the plant, place it in, pressing it in gently, give it a splash of water and cover it in. Once again, you will need to give them room to grow with no interference- 10-15 centimetres should be plenty. How thirsty will they be? To have a successful herb garden, you must be vigilant with watering, especially when they are young as this is what will ensure their roots becoming established and they are able to grow into healthy and strong herb bearing plants. To begin with, herbs will need to be watered very regularly so that their soil is consistently moist. Once the plants are older and more established, they will require watering 1-2 times per week, or as needed (those in hot climates may need to up their watering a little). There aren't really any hard or fast rules when it comes to watering your herbs, it is best to decide based on observation- if they are looking a little wilted, or the soil is dry, chances are they are in need of some H2o. There is one major pearl of wisdom we can pass on to budding herb gardeners- don’t over fertilise! Many will think that the addition of fertiliser will help their little herbs grow like crazy, but if you go overboard on the fertiliser it can in fact cause the opposite. Most herbs will grow just fine without the addition of fertiliser, especially if the soil has been treated with some compost or organic matter prior to planting. If you do wish to give your herbs a little helping hand occasionally (very occasionally! ), we suggest using an organic fertilizer. So now that you have ticked all of the above, you wait! It won’t be long before you start seeing a few sneaky sprouts popping up from the soil. To keep your herbs healthy and growing, make sure you don’t jump the gun too early and harvest while they’re still young- it will pay to be patient. If your herbs are growing like mad you may need to move them to a larger pot to give their roots a little more space so they can grow into a healthy plant that will be able to provide you with many herbs for plenty of dishes to come. 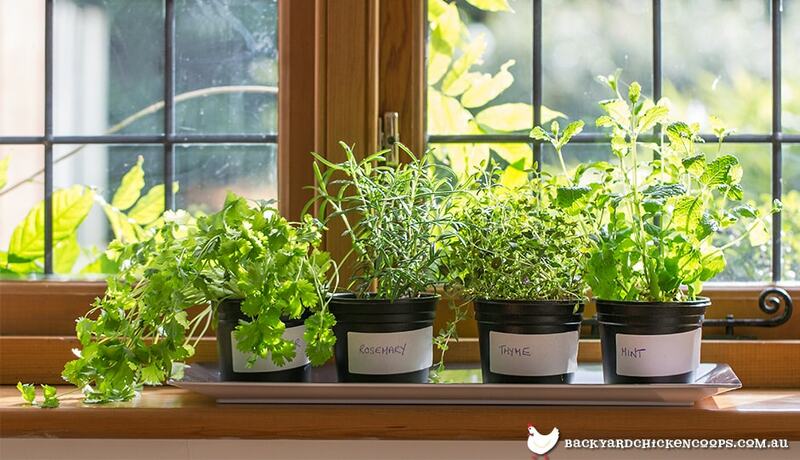 Find a few of our favourite herbs below and how we like to incorporate them in the kitchen. If you have chickens, be sure to check out all of our herbs for hen health articles, and put your herbs to good use for your poultry pals. Coriander- a citrus style herb that goes great in Mexican and Vietnamese inspired dishes. Add some to home made rice paper rolls, or when you whip up a mean burrito bowl. Mint- a fresh flavoured must have. Chop and stir through fruit salads, or mix into cocktails for a refreshing hit. Thyme- a very versatile herb that pairs particularly well with eggs. Mixed into a scramble of an omelette is our pick. Rosemary- very fragrant and woody flavour that is outstanding with lamb. Chives- has an onion flavour, also works well with eggs. Basil- one of the most popular herbs. Compliments tomato based sauces, so sprinkle some atop your next spaghetti dish. Parsley- another very popular herb that is best added into meat and seafood sauces. Oregano- it’s a little spicy and a little sweet! We love adding atop homemade pizzas- bellissimo! Sage- this aromatic herb teams well with pork and stuffing.